Meet the Lil' Gleemerz - the adorable fun-makers with rainbow light-up tails and quirky sounds and phrases! The Lil' Gleemerz are lighting up kids' lives with fun and Friendship that positively glows! Amiglow is bright teal with big, glowing eyes and a furry LED light-up tail. This interactive furry friend responds to touch and sound with over 100 reactions to discover. Simply press the nose for three ways to play - in hangout, light party, or game mode! In hangout mode, pet and pinch Amiglow for purrs, growls, jokes, funny phrases, and more. 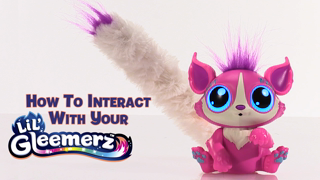 Meet the Lil' Gleemerz - the adorable fun-makers with rainbow light-up tails and quirky sounds and phrases! The Lil' Gleemerz are lighting up kids' lives with fun and Friendship that positively glows! Amiglow is bright teal with big, glowing eyes and a furry LED light-up tail. This interactive furry friend responds to touch and sound with over 100 reactions to discover. Simply press the nose for three ways to play - in hangout, light party, or game mode! In hangout mode, pet and pinch Amiglow for purrs, growls, jokes, funny phrases, and more. In light party mode, clap or play music and its eyes and tail will flash to the beat for a dazzling light show. In game mode, play three different games with Amiglow (Catch the Kiss, Tail Tennis, and Stop on the Spot) with the traveling lights in its glowing tail! 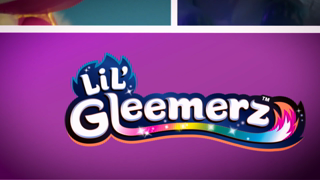 Lil' Gleemerz are also available in a variety of bright colors. Collect them all for even more bright and curious adventures, because the Lil' Gleemerz can't wait to meet you! ​It responds to touch and sound with over 100 reactions to discover (it purrs, growls, farts, says funny phrases, flashes dazzling light shows, and even plays games with you)! We apologize for the disappointment. Our team would like the opportunity to help. Please give us a call at 800-5248697. Support is available Mon.- Fri., from 9:00 a.m. - 6:00 p.m. EST.